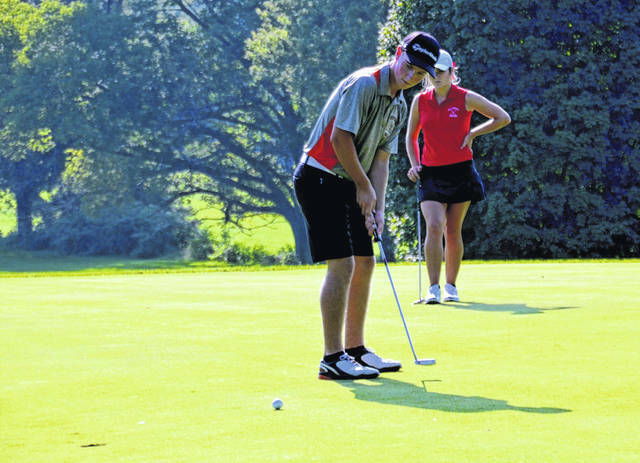 Whiteoak’s Zach Harless putts as Hillsboro’s Kristin Jamieson watches from behind on Monday at the Elks Golf Club in Hillsboro where the Indians took on the Wildcats in a cross-county golf rivalry. Hillsboro’s golf team hosted the Wildcats of Whiteoak on Monday at the Elks Golf Club in Hillsboro. The Indians won by a score of 187-194. Kristin Jamieson led the way for the Indians as she shot 39 for the match and earned match medalist honors. The Indians scorers on the day were Will Kiefer who carded a 46, Ryan Harless who finished with a 51 and Brennen Priest who also had a 51 in the match. Hillsboro was also represented by Gavin Puckett with a 53 and Lawton Parry who had a 57. The Indians traveled to Jackson on Tuesday to take part in the Frontier Athletic Conference boy’s golf match number two. Reach Ryan Applegate at 937-402-2572, or on Twitter @RCApplegate89. Chris Hoppes, the sports editor for The Record-Herald, contributed to this report.